Last week, my colleague Joe Giacona talked about why ventilation is critical within food transport refrigeration. With many fresh foods making an average journey of 1,500 to 2,000 miles from their source, well-engineered refrigeration systems and fine-tuned logistics ensure that these fragile foods remain delicious no matter their destination. This week, we continue the food chain journey through the supermarket right before it is purchased for use at your home. As with the containers inside ships and trucks, consistent and efficient refrigeration in holding warehouses and at the supermarkets themselves provide a slowing of the clock to help maintain food as long as possible. Commercial refrigeration systems must maintain safe temperatures; perform reliably and efficiently while working continuously in the background. In keeping with our company’s GreenTech philosophy, ebm-papst developed a specialized line of air movers to help refrigeration engineers meet their critical design objectives. The ecological benefits are achieved with features such as programmable speeds to dial in the exact air needed, two speed fans that allow the fan to change speeds without complicated wiring or variable speed operation that allow ebm-papst fans’ EC motors to operate over a full RPM range to match the cooling performance needed without wasting energy. These various features are found in our product line so it is easy to choose the right air mover for the refrigeration system. Our small mounting footprint and quiet operation provide refrigeration designers with exciting new approaches to solving old problems. To help your local supermarket maximize your food shopping experience, our fans are designed into various refrigeration systems that you will see in a typical supermarket. Once the food products arrive at the supermarket they are unloaded from the trucks and usually placed in a "walk in" cooler (or freezer). Most walk in coolers are near the loading docks at the back of the store hidden from public view. Even if you have not been behind the scenes, you still have encountered them during your recent shopping. One side of the unit cooler is typically made out of glass display doors that are open to the public. Fast moving items like the milk in a supermarket or the beer in a liquor store have doors that you open so that you can select your product. Since these products are usually in the back of the store, they are against a wall near the loading docks so they can be restocked with little effort. This allows the store to keep large inventories of product and have it appear so that it is always stocked. Next time you open one of those doors, peak in behind the milk or beer, if you don't see the fans up above, you will hear them running as well as feel them move the air around the area. Fans are needed to keep the air in constant circulation within these cases to help keep the products cool. The other key refrigerated areas of a supermarket are the display cases that hold fruits, vegetables, frozen foods and every other possible food product including recently refrigerated pet foods in the pet food aisle. These display cases must perform two important tasks: They must keep food at a constant and precise temperature, and present the food in a way that shoppers can easily see it, want it and ultimately put it in their shopping carts. This is not an easy task but our ebm-papst EC fans meet the challenge even while they are subjected to constant cold temperatures, moisture from misting systems and the bumps and jarring from stocking these cases every day. The reach in bottle cooler is another example of a refrigeration system that is in constant operation, keeping soda and water cool for impulse purchases. 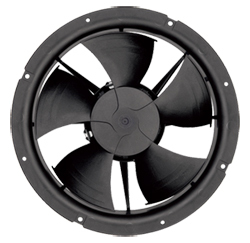 ebm-papst EC fans are used on both the hot (condenser) side and the cold (evaporator) side. Your home refrigerator has it easy compared to what a bottle cooler goes through every day. Multiple opening and closings and constantly being loaded with room temperature products gives these coolers a workout. Our fans keep refrigerated air in constant circulation to help cool down product as quickly as possible. Our last stop on how fans are used in our supermarket, ends with a birds-eye of the condenser units on the rooftop. All of the reject heat from the refrigeration systems throughout the store is sent to the rooftop condensers. Our variable speed, EC Giant series of fans are installed here and are running at just the needed speed to cool down the refrigerant. Variable speed helps increase efficiency compared to running standard fans in an on and off manner. 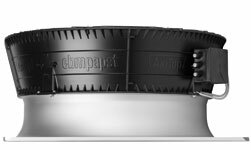 By adding our latest AxiTop diffuser these EC Giants are operating quietly so that there is no unnecessary noise pollution and they are providing increased efficiency to help supermarkets further reduce their utility bills. With his 11+ years experience with ebm-papst Inc., Lou Moffa listens to the challenges our customers face and recommends air-moving solutions that help refrigerant system engineers, warehouse owners and supermarket managers keep food fresh across a variety of storage and display environments. As the company’s market manager – commercial refrigeration, Lou holds an automated manufacturing engineering degree from Waterbury State Technical and a Bachelor of Science in Manufacturing Engineering from Central Connecticut State University. In his free time, Lou enjoys tackling renovation projects around his home, cooking and exploring new food shopping experiences.